The CHICAGO AMWA Consortium is actively seeking to grow our partnership base, to ensure our programming is diverse, innovative and serve the needs of our membership. 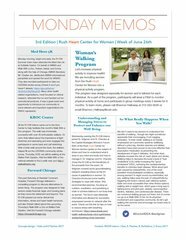 The Chicago AMWA Consortium is a unique opportunity to reach a group of talented physicians in the Chicago medical community. 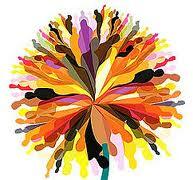 The Consortium is a great way to reach key audiences with messages about your services or goals of your organization. If you are looking for ways to incorporate trusted healthcare information and diversity and inclusion initiatives into your organization's efforts, consider partnering with the Consortium. The opportunity to support CAC- the only one of its kind in Chicago - bringing women physicians together to provide leadership to each other and service to the Chicagoland community. Exposure to women physicians from different practice groups and institutions. WHAT ARE SOME PARTNERSHIP OPPORTUNITIES? Our partnership with the RHCW, offers a unique and rewarding internship that enable pre medical and medical students to gain firsthand experience and learn valuable skills to prepare them for a career in clinical medicine and medical research. 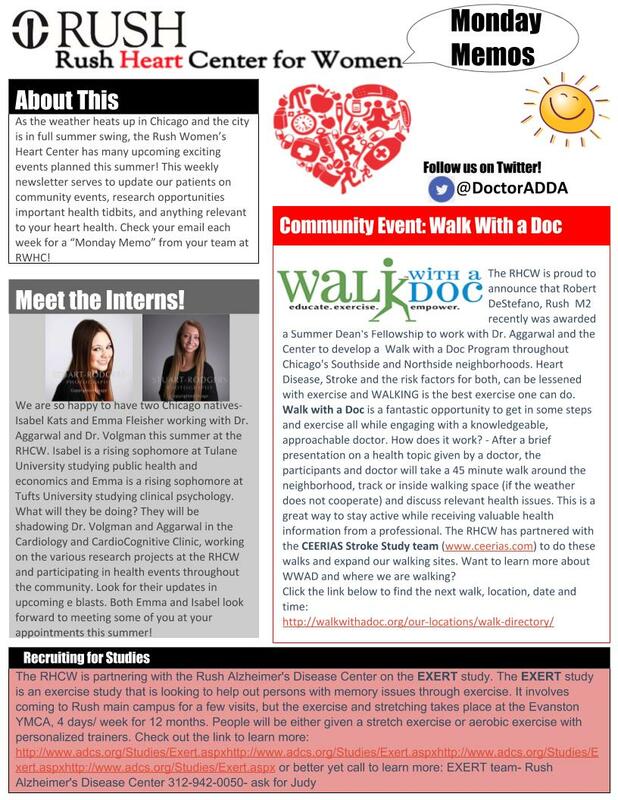 With the rise in activities in population health, medical students soon realize that they have limited experience in training that incorporates experience, and knowledge in the role of social determinants of health, cultural competency and legal advocacy related to healthcare. 1) A Practicum, lasting 4 - 8 weeks in which the pre medical or medical student participates in and completes a community engagement project that involves one or many of our Partners and practice members. 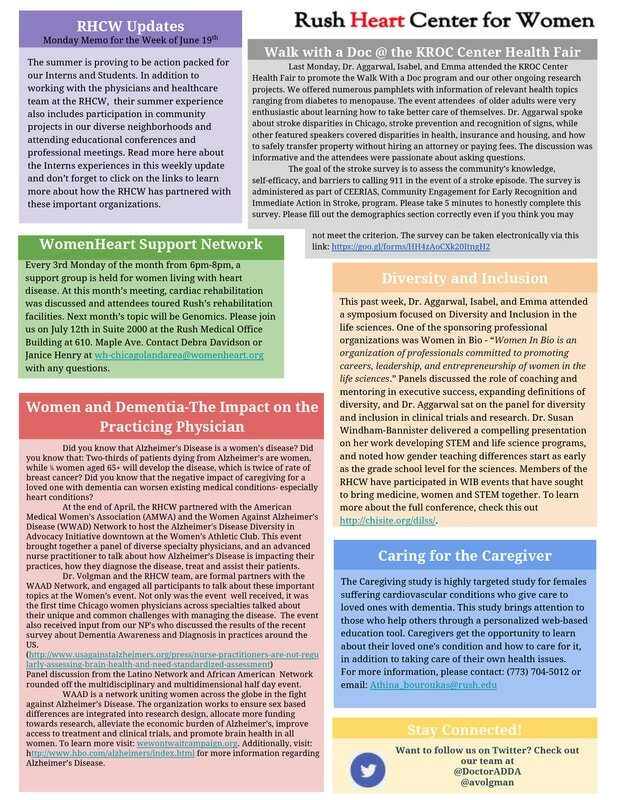 The type and scope of the project will be discussed by members of the RHCW and CAC Board and will culminate in a written report and poster submission to the National AMWA meeting, Women Physician Congress meeting and a presentation at the CAC August Networking Salon. 2) Seminar Series: The Intern will attend a series of workshops, research, clinical meetings and field work to gather a real world perspective on how clinical services and population based research occurs. Activities will include routine project work that range from health survey implementation, community health promotion, and educational initiatives planning to infrastructure support. Pre medical, third and fourth year medical students are eligible to apply. 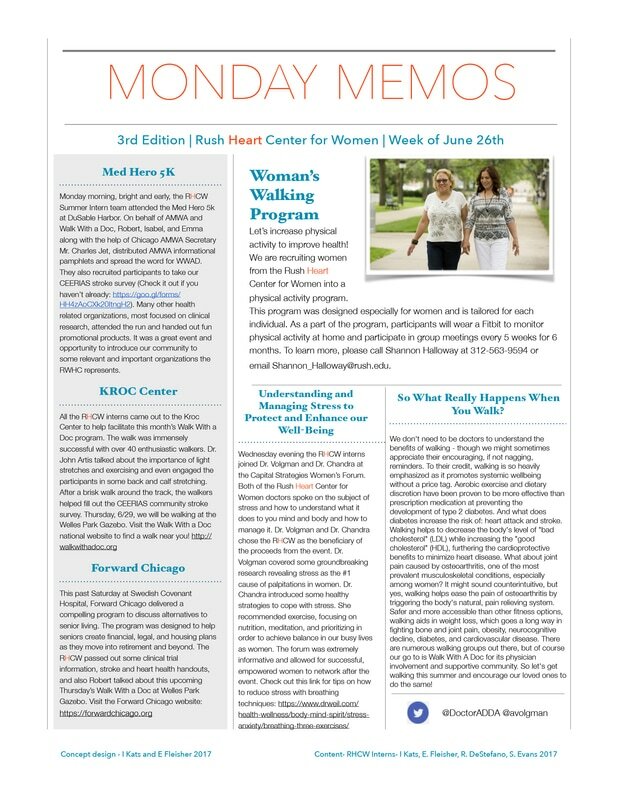 3rd Edition - Rush Heart Center for Women Newsletter. 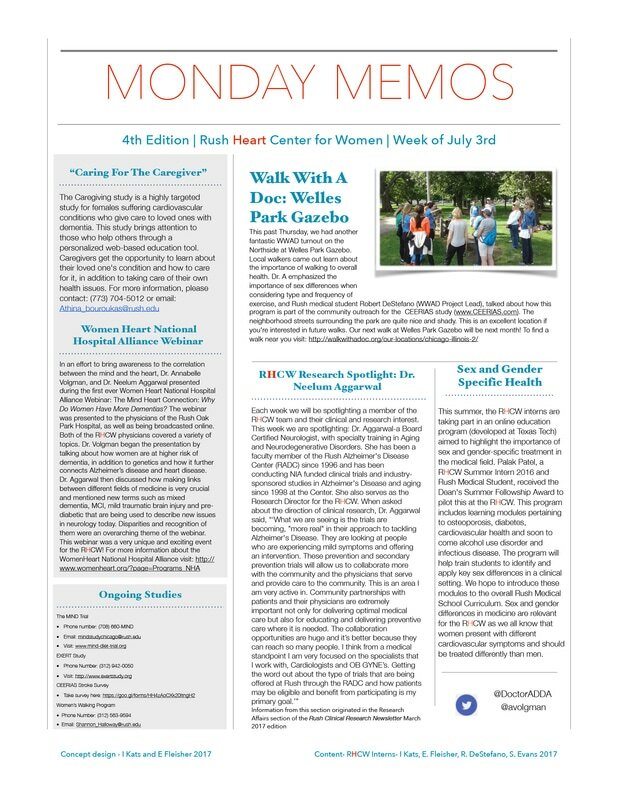 4th Edition - Rush Heart Center for Women Newsletter. 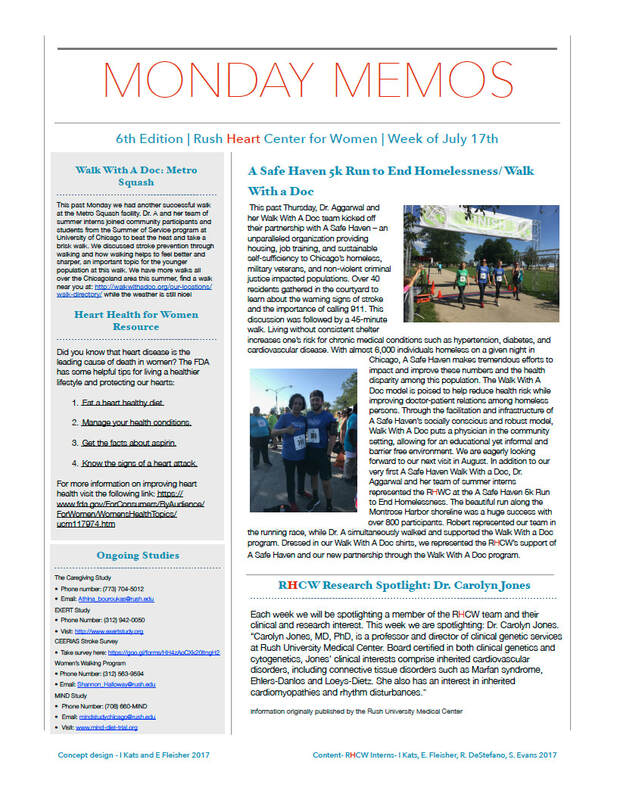 6th Edition - Rush Heart Center for Women Newsletter.